The name means “hundred-legged worms” and they can live up to 6 years. The first set of legs are actually jaws and they have been known to bite human when handled carelessly. The good thing is thaty they prey on insects and spiders. There are two types: the outdoor centipede and the house centipede. The house centipede can make its home inside the house although most centipedes are only temporary intruders. 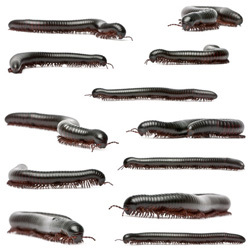 Millipedes occasionally invade a home because of drought or heavy rainfall. They enter basements, garages and room on the first floor. They come in numbers from a few to hundreds or thousands. In the fall, they may come in seeking warm quarters. They are harmless but undersirable. Keeping your house dry and well ventilated goes a long way toward discouraging resident centipedes. Keeping the area around foundations clear of trash, leaves, and litter will aslo help keep them away from the house. They vary in size and are dark in color. The type of wood and exit holes will help to identify which species is attacking. Larvae do the damage as they burrow below the surface of the wood. One of the first things to determine is if the infestation is active or inactive. Most emergence happens from April to July. Painting or varnishing wood and reducing moistrue levels will help to keep infestations from starting. They mostly attack wood that is less than 10 years old. It is possible to hear larvae chewing their way into the wood. Adults are 5/8 to once inch long and brownish black. Adults emerge from July to August. Central heat and good ventilation will generally keep the humidity level low and damage will likely be llimited to a few boards. A list of their diet makes it look as though they eat anything organic. Females lay up to 100 eggs. Larvae do the destruction and avoid light. Careful inspection of such things as baseboards, air ducts, stored cereals, garments and furniture is needed to find the source of infestation. Cleaning the house thoroughly and regularly as well as proper storage of garments is needed to prevent infestations. There are two common types of flour beetles- the confused and red flour beetles. The adults are about 1/8 inch long. The bad news is that they can become very numerous: the good news is that they do not bite or spread disease. They only eat broken kernels and grain dust. Females lay from 300 to 400 eggs which mature in about 2 to 3 months. The aduulst may live more thatn 3 years. It is a good idea to check food packages at the time of purchase to be sure that you don’t import the bus to your home. Keep foods in tightly closed containers or in the refrigerator. If you find flour beetles, dispose of the food after wrapping it in a bag. Clean cabinets thoroughly to remove any food particles or dust. Fleas are brown to black in color and about 1/6 of an inch long. A female flea will generally lay for to eight eggs after each meal- possibly more than 400 over a lifetime. Larvae will make their way into carpets or in cracks and remain from five days to three weeks to mature. While in the cocoon they are protected from pesticides. A disturbance such as pressure, heat, or noise will trigger the emergence of the flea from this cocoon. It isn’t just waht you see since typically, a flea population is five percent adults, 10 percent pupae, 35 percent larvae and 50 percent eggs. Treat the pet. Research shows that neither garlic nor sices are effective in replling fleas. Vacuum the house.Be sure to discard the vacuum bag when finished. Treat the house. Spraying floor areas will provide long-term control of larvae. Treat the outdoors. Application of insecticide should be done to all areas where the pet spends its time.